The front of this postcard does not explicitly make it a Christmas postcard. 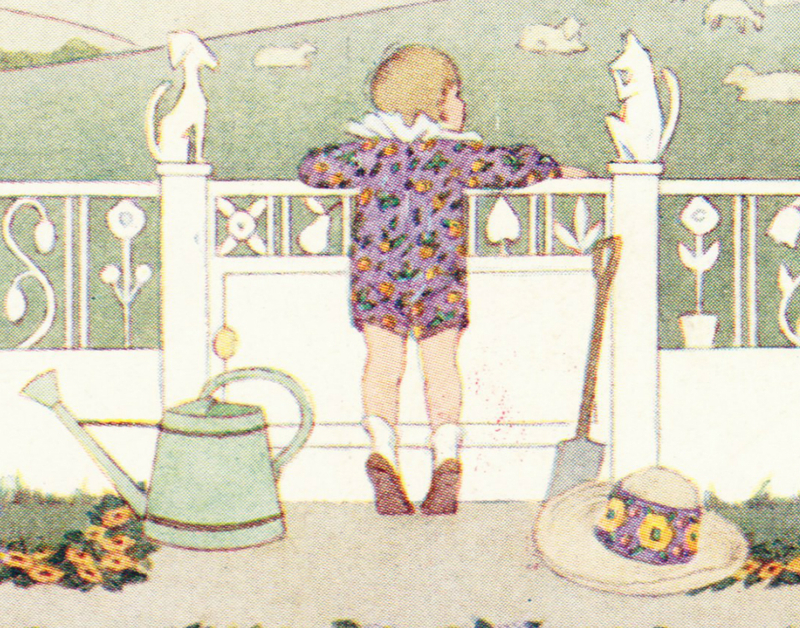 It's a nice illustration, in greens and purples, of a child gazing at a field of sheep. 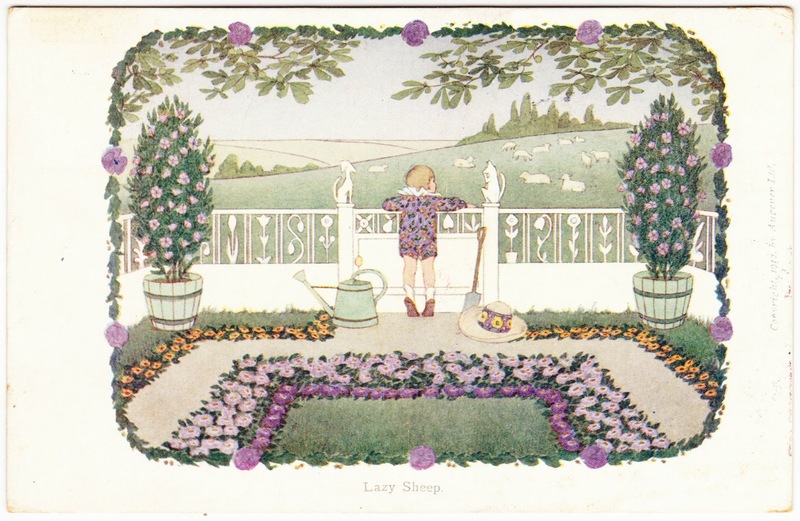 The title is, indeed, "Lazy Sheep" and the postcard is copyright 1912, by Augener Ltd., which was located in London. SMALL RHYMES FOR SMALL PEOPLE. ILLUSTRATED BY H. WILLEBEEK LE MAIR. That would be Dutch illustrator Henriette Willebeek le Mair (1889-1966), who would have been just 23 when this postcard was published. 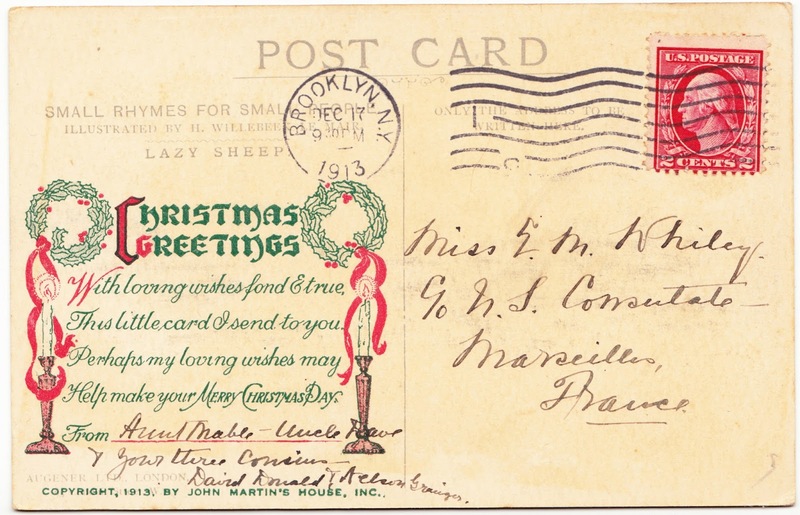 This postcard has been given a CHRISTMAS GREETINGS addition on the back, on the left-hand side, with the additional copyright of John Martin's House Inc. I can't tell if the addition is a well-placed stamp or if a special set of the cards was printed separately. You can see what the postcard looks like without the CHRISTMAS GREETINGS here. This was postmarked on December 17, 1913, in Brooklyn, New York, and mailed — for just two cents! — across the Atlantic to Miss E.M. Whiley at the U.S. Consulate in Marseille, France. The postcard was sent by Aunt Mable, an uncle whose name I can't quite decipher and cousins David, Donald and Nelson Grainger. A final fun fact: While researching this postcard, I came across a Joe Silvia article on NewBedfordGuide.com titled "The curious cases of mailing children in 1913-1914." I think you'll find it an interesting rabbit hole to go down.